I live and work in London, but I was born and raised in northern Spain, in Asturias. 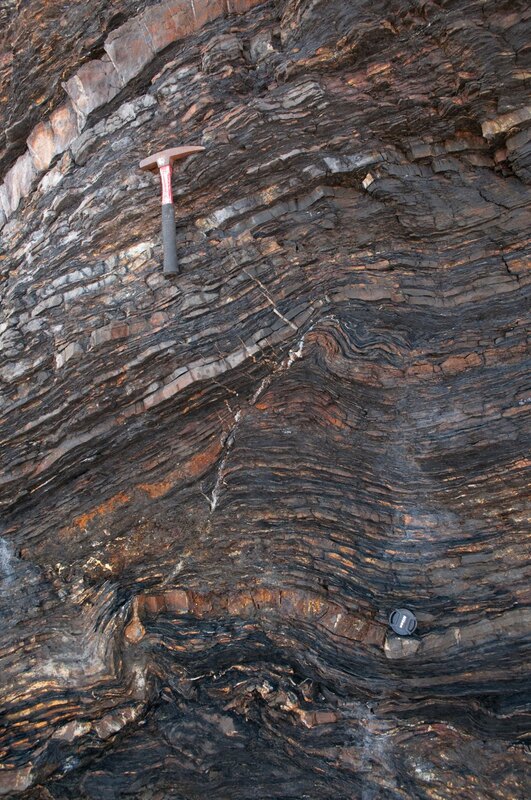 I studied Geology in the Universidad de Oviedo, in the foothills of the Cantabrian Mountains. 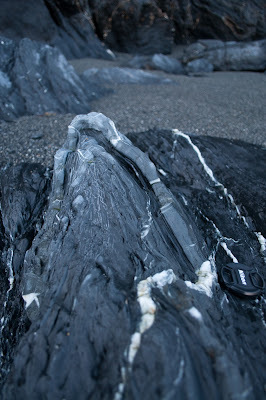 Such a privileged geographical and geological location means a lot of fieldwork and great landscapes. 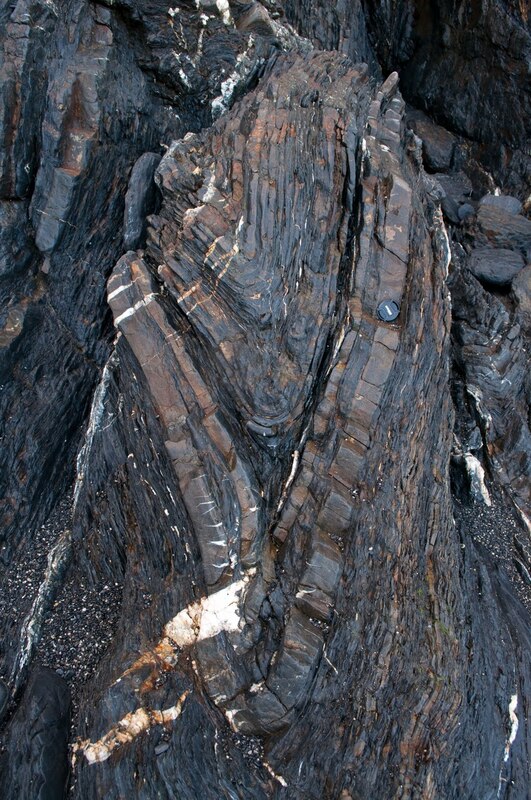 In short, the NW of the Iberian Peninsula is a remanent of the doubly vergent Hercynian Orogen (see figure attached), formed during the Devonian-Carboniferous time by the collision of Laurussia (or Euramerica) with Gondwana, forming Pangaea. The attached map shows the zonation of the Hercynian Massif in Iberia: the Centroiberian Zone (in green) is the crystalline core; the Ossa-Morena Zone and the Western Asturian - Leonese Zone are the metamorphic hinterland at both sides of the axis of the orogen; and the South Portuguese Zone and the Cantabrian Zone are the external areas of the foreland fold and thrust belts. The orogen strikes in NW-SE direction in the central area of Spain, and this evolves towards NE-SW direction in the North of Spain. This rotation occurs around the Asturian Arc (which is the eastern region of the Cantabrian Zone). 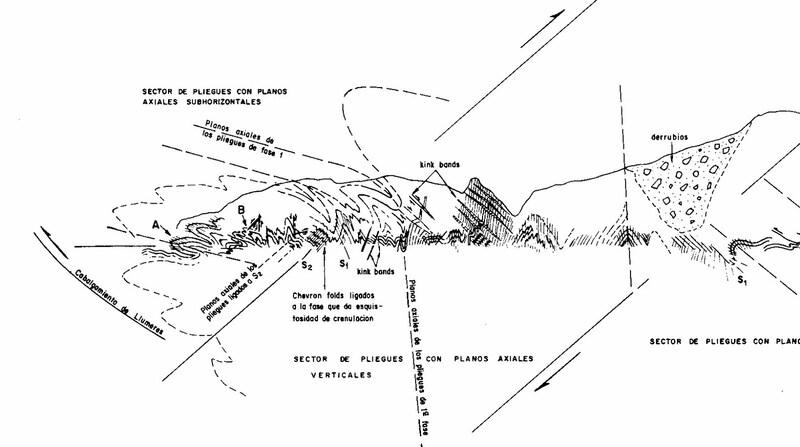 Figure 2 shows cross section approximately WNW-ESE, cutting through the north coast of Spain, from Galicia to Asturias. 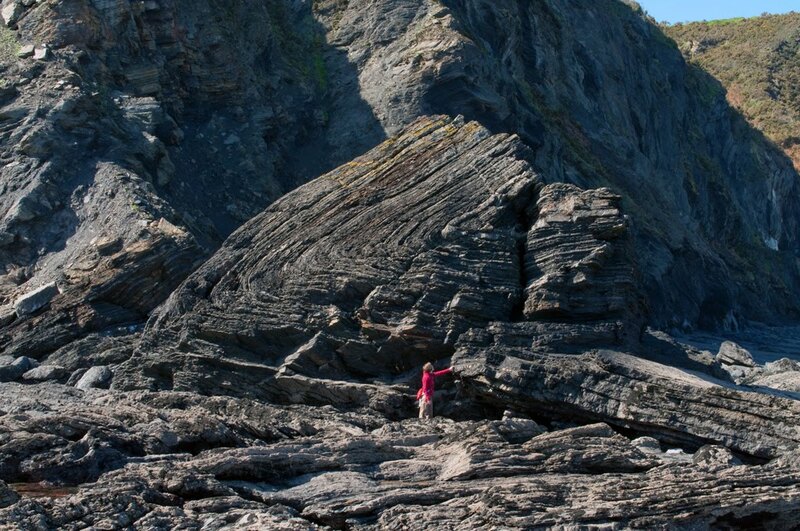 The Narcea Antiform separates in Asturias the Western Asturian - Leonese Zone (WALZ) and the Cantabrian Zone (CZ). 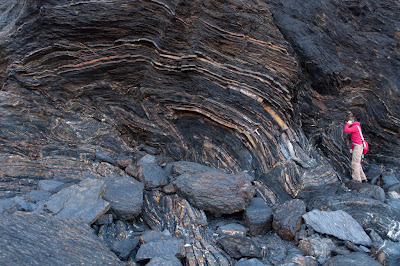 The WALZ is characterised by a generalised regional metamorphism, increasing westwards, whilst the CZ it is not affected by metamorphism, being deformed by thrusts and folds. 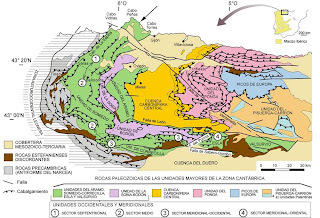 The Cape Peñas is in the Cantabrian Zone, which is portraited in t headjacent diagram. It presents a Palaeozoic succession which is partially covered by the Mesozoic-Tertiary basin, including materials from the Permo-Triassic to Neogene. In this article I want to show you some pictures we did in the Bay of Llumeres. Llumeres is in the eastern side of Cabo Peñas (the most prominent cape in Asturias), and it is part of the Cantabrian Zone of the Hercinian Massif in Spain. 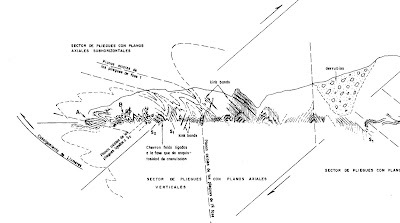 The following cross section (looking onshore from the sea, so WNW to the right, ESE to the left), shows the general structure of the place. 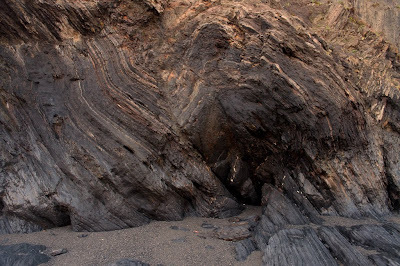 Basically, in Llumeres there are very good examples of polyphase deformation: a first phase forms the recumbent and overturend folds with east vergency, and also develops a weak slaty cleavage. The second phase of deformatin forms kink-bands and crenulation cleavage. You can find more information in the following classic paper, written in the 70's by Julivert. 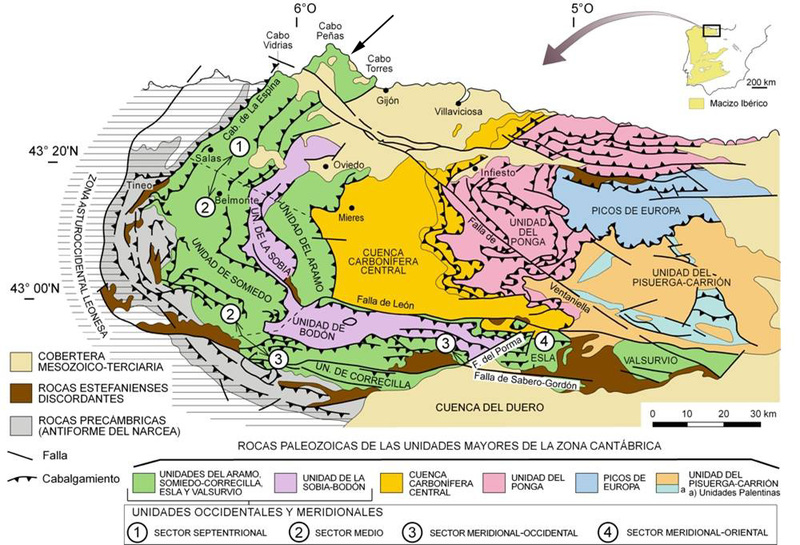 It is in Spanish, but I strongly recommend you to take a look at, as the diagrams are beautiful and the photographies very clear (although in B&W). Note that my first two pictures are intentionally a copycat of the first two plates of the paper! The first picture shows a beautiful overturned chevron antiform in Formigoso Shales Fm (Silurian). 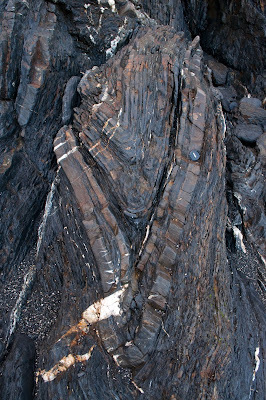 This fold is a first deformational phase structure. Some kink-bands (second phase) are visible. This fold is tagged as "A" in the schematic cross section presented above. 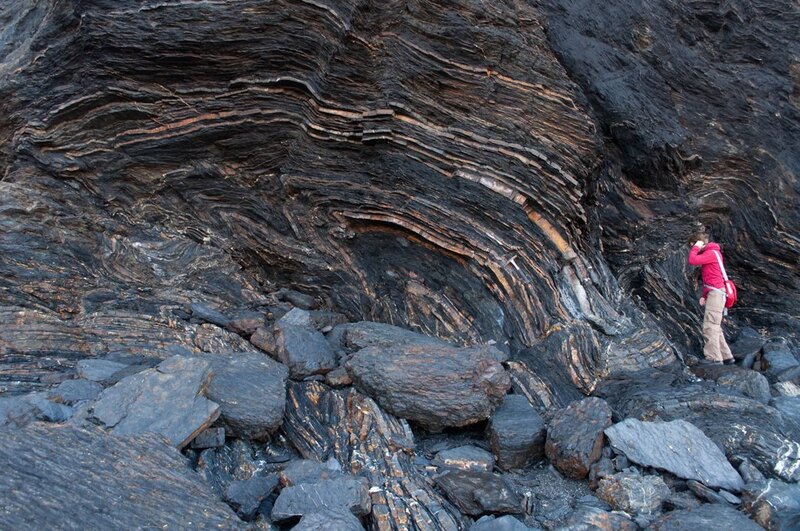 Second picture is a fantastic overturned chevron anticline. 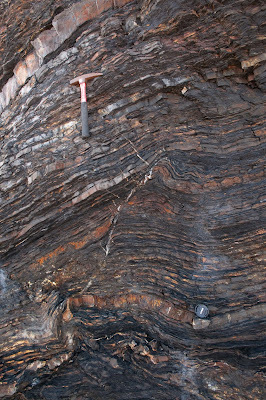 The anticline, formed during the first phase of deformation, shows very good examples of kink-bands developed during the second phase of deformation. Note also the M fold in the hinge of the structure, and the Z folds in the right flank. 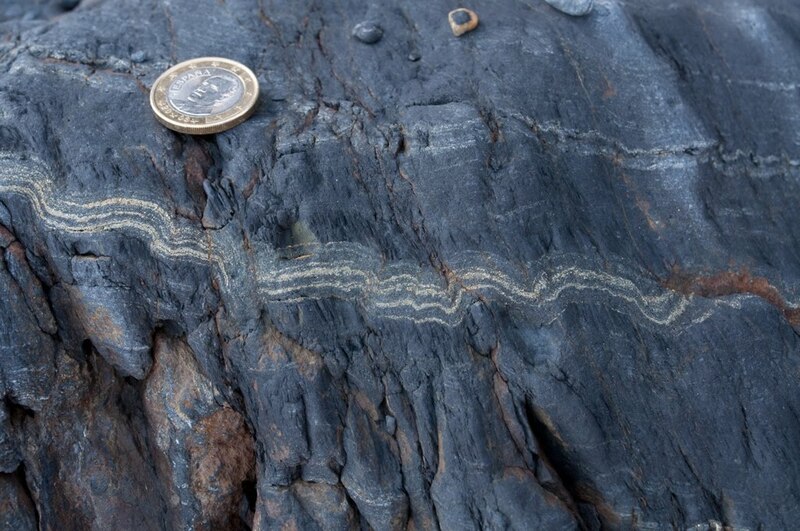 A synform, depicting the presence of quartzitic veins formed during the folding process. 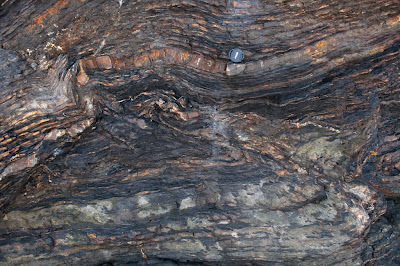 The synform also shows a hinge fault. wow, the first two pictures are really nice. Is that near the coast? And that is when Jedrzejczyk reversed the script and asked the reporter to quantify to the podium. What happened next will make you cringe.